Increasingly, when we consider a reform at home, we consider every single detail. The bathroom floor is precisely one of these details, because a basic tile floor is not enough, there are many more decorative options. What at first may be an easy choice, it really is not so, at least if we give importance. And there are different floors for bathing among which we can choose. Before buying it, we must know what is really we want, that is, if we want a durable floor, if we make it warm, resistant, beautiful, easy to clean, etc. 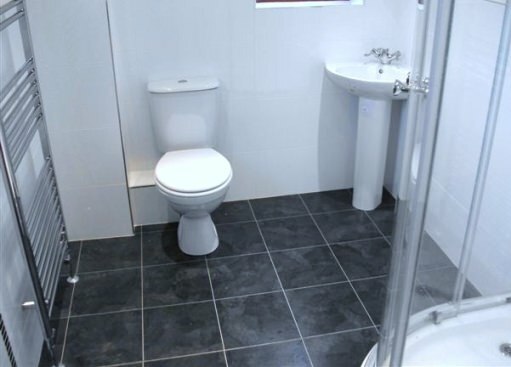 The first thing we must bear in mind is that the bathroom is a wet area, so choosing a floor carpet, for example, is just not good idea… In addition to peel off, the moisture retained in the carpet and the awful feeling of standing on something wet are not too pleasant, not to mention the number of infections that can occur. Wood is not very good idea, the humidity makes bulge and, therefore, damaging it. However, the laminate floor, if manufactured from recycled plastic, can be highly resistant to spite of the humidity. The natural stone can be perfect, although it is true that it is a expensive floor. If we go for this option, it will be rough and slip stone to prevent from slipping with wet feet to get out of the shower. This floor is complicated to fit, so it will take to do so professional. What is the most economical floor to the bathroom? If we don’t have enough budgets to put stone, we can also put marble in the bathroom. It is a perfect, something cheaper than stone, very durable and resistant as well as being easy to clean floor. The tiles are also a good choice, probably the cheapest. It is no longer the boring stoneware tiles throughout lifetime, now there are some very original and decorative in the market among which we can choose.